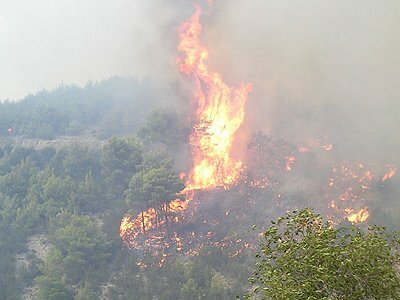 Forest fires do not just happen in remote areas. Urban and rural subdivisions, farms, acreage and cottages are all potentially threatened by forest fires. In Ontario, fires threaten or destroy many homes every year. Taking some basic steps will help reduce the threat of forest fires to your home and family. Evacuate. Evacuate your pets and all family members who are not essential to preparing your home. Anyone with medical or physical limitations and the young and elderly should be evacuated immediately. Remove combustibles. Clear items that will burn from around the house, including wood piles, lawn furniture, barbecue grills, tarp coverings, etc. Close or protect all openings. Close outside attic, eaves, fireplace and basement vents, windows, doors, pet doors, etc. Remove flammable drapes and curtains. Close all shutters, blinds or heavy non-combustible window coverings to reduce radiant heat. Shut off gas at the meter. Only a qualified professional may turn the gas back on. Turn off propane tanks and move them at least 10 metres (33 feet) from your home if possible. Connect garden hose to outside taps. Place lawn sprinklers on the roof and near above-ground fuel tanks. Wet the roof. Fill any pools, hot tubs, garbage cans, tubs or large containers with water. Wet or remove shrubs within 5 metres (~15 feet) of your residence. Face car in the direction of escape. Shut doors and roll up windows. Leave the key in the ignition and doors unlocked. Close garage windows and doors, but leave them unlocked. Disconnect automatic garage door openers so doors can be opened manually if the power fails. Move flammable furniture into the center of the residence away from windows and sliding-glass doors. Valuables. Place important papers, mementos and anything “you can’t live without” inside your car, ready for departure. Lights – turn outside and inside lights on to make house more visible in heavy smoke. If advised to evacuate, do so immediately. Follow the instructions provided and use the route determined in the evacuation notice. Watch for changes in the speed and direction of the fire and smoke. Follow the instructions provided by local government and see later sections for advice on how to recover from a disaster.